Make Story Books: Story Jumper! Hello! It's me again! I will introduce you a website that my friends presented at school: StoryJumper! It is a website that you can create your own story book. You can create cover page, add text, upload drawings or photos to illustrate your story and then you publish a real book. The site says that it is free but you can just create your book freely. Printing the book is not free. You have 3 options. You can either have hardcover book for 24.95$, a paperback book for 12.95$ or a digital download for 1.95$. But you can share and embed it for free. Now, let's discover the site! Go to the storyjumper. First, we create our cover. We can change font of our title, colour of our cover and add photo as background. And next, there is a dedication page. On the left side of the page, there are some parts: text, props, scenes and photos. In text part, you create a text box and write your story. And also you can add different text boxes. In props part, you can find many characters and items that you can add your book according to your story. You can search with keywords like: panda, forest, animal etc. In scenes part, there are backgrounds that you can add your book. You can search in this part, too. And last, in photos part you can both add your own photos and search on the web. Hello everyone. As a weekly project we were supposed to introduce a website that we can use in our lessons. My partner was Ebru and our website was Powtoon! Powtoon is a combination of presentation and animated cartoon. It is an online tool that allows you to create animated cartoons. It is very simple to use and you can create animations according to your creativity and imagination. 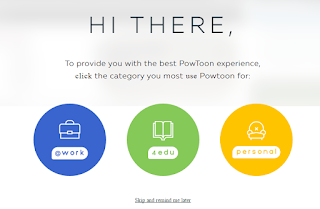 You can use Powtoon for different purposes: For your works, your education or any personal training. Now, I will demonstrate how to use Powtoon step by step. Let's enter Powtoon. In home page, we see that we can sign in with our google, facebook or linkedin accounts. Or we can join for free. When we join we can achieve all tools that premium members have for 2 days. You can both use readymade temples and your own scratch. On the right there are library, backgrounds, sounds, images, texts etc. that you can add to your animation and can relocate and resize them. First, start with background. There are readymade backgrounds and also you can upload a photo from your library and a webpage. Then write your title. You can arrange your text’s time. By clicking edit button next on the text you can add entrance and exit effect. At the same time, we can add and remove seconds to timeline. The limit is 20 seconds. You can choose characters from library part and can change your character’s poses. Then, you can add effects to transitions between scenes, too. There are many different things. 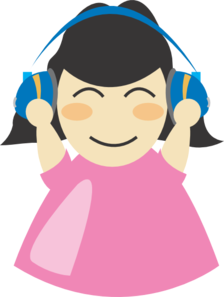 You can add your voice recordings and background music or use powtoon’s backgrounds. Also you can audio record your voice on website. You cannot download it directly to your computer. So you can share it in youtube and then download it from youtube. If you ask my opinions about that tool: I think it will be a very effective and easy tool for you and your future students if you want to improve your students' learning through multimedia in the modern classrooms. As all other tools, Powton has some disadvantages, too. The first one is that you have only 2 days of free version. And to download the animation you make, it forces you to get a premium account. But we gave the solution to you. You can share your animation on youtube and download from there. The second disadvantage is that the page sometimes can be very slow. You may have trouble with moving objects around. As the world changes, the people’s relationships between each other become more and more collaborative. Every human being needs another one to live. But we, humans, do not use just one language in the world. So, it sometimes becomes hard to communicate. Besides all foreign language schools, courses, books etc. there are also other things that promotes our learning. Undoubtedly mobile apps are one of the best ones. As a weekly project, we were supposed to introduce an app that can be installed and used on a mobile device for language teaching/learning purposes. My mobile app is : Busuu! Busuu is an online language learning community which enables learners to learn a new language. You can use it online on its website or you can download it to your mobile phone There are 12 languages you can learn. It covers 150 different topics based on day-to-day situations, with over 3,000 words and example phrases. The study material for a language is around 150 units. Units consist of multiple-choice questions, speaking assignments and writing assignments. Some sections within each unit include multimedia material, such as spoken multiple-choice questions. Users act as both student and tutor, correcting one another's work. They can converse via chat-window, an audio connection, or a webcam connection. All of the units are designed for your improvement of reading, writing, listening and speaking skills. Activity example; learners can develop their writing skills by writing about any topic and sending it to native speakers to correct their mistakes. Not just kids but also teenagers, adults and even old people love stories. For example, is there anyone who does not know Little Red Riding Hood? Or is there anyone does not want to be a prince or just a character in a story? Then, what about using stories in our teaching? Moreover, what about using digital stories? Digital story can be described shortly as full-motion video with sound. It is mixture of images, graphics, music and author's own story voice. With the help of these stories, we can go beyond traditional storytelling and engage students in our topic. 1-We developed characters and wrote the script. 4-We used Powtoon to make our story. Powtoon is a combination of presentation and animated cartoon. It is an online business presentation software tool that allows you to create free, cool, and awesome animated cartoons. The only thing you should do is just joining for free. And the rest is your creativity. When you join, you can achieve all tools that premium members have for 2 days. 5-Then finally we added our background music in Moviemaker. We enjoyed during our project. Sometimes, creating scenes became problem and also arranging voices and musics accordingly, too. However, it was good. And when we come my opinions about using digital storytelling in foreign language education: it is useful for all ages. If we want our students to create their own stories, we should support them with our help closely, if they are young. Especially for their thinking in target language and pronunciation, it is very effective. As a future teacher, I believe that it will be very fun both for me and my students to use digital stories. Quizlet is a free website created by high school student Andrew Sutherland in 2005. And now, contains over 400 million study sets. Quizlet is for high school and college students, language learners, grad students, home-school students, teachers … Anyone studying anything, frankly. I think the best thing about Quizlet is: It is free for students! And as a difference, all of the material is user-generated. Quizlet is good for studying almost any subject, from languages and vocabulary to history to science and the arts. It is providing learning tools for students, including flashcards, study and game modes. Students enter the material they need to learn for a class or exam, and Quizlet provides tools and games to help them learn their stuff. You can add images and listen to audio, and even study on the go with one of dozens of Quizlet-compatible mobile apps. It makes it easy to create and share study materials, to study with a few friends or an entire class. As a student, the only thing you have to do is joining. When you join, you will see this page below, (it is my own) and that's all! You are ready to create your own exercises and also see others' examples. As Benjamin Franklin said: Time is money. Our world is developing and changing; We want to reach news as soon as possible. 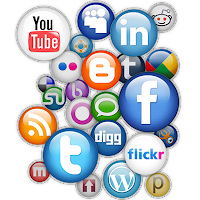 The internet with more than a billion existing pages and thousands more being created each day, is the best way to conduct. We may sometimes lack of reaching the speed of all the mass. There are many blogs, websites etc. and little time to follow all of them. So, it is possible to get lost. But the condition is not that bad! 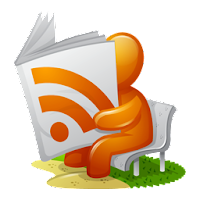 This week, the task our teacher gave us was writing a post about RSS feed and blogs we follow. It means, I have learned a new add-on: RSS(REALLY SIMPLE SYNDICATION) It is a program that runs in the background and constantly waits for your favorite sites to post new content. When something new pops up on a site you follow, it instantaneously drops your feed reader. In other words, it allows you to see which websites have new articles and which don't. You are also able to see past entries. Using RSS can save you lots of time on a daily basis. For example, in order to visit all of the pages you are interested in, you just check your RSS feed reader and see what is going on. That's all! "Here I stand and here I'll stay! " said Elsa. 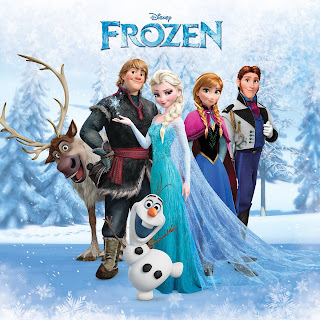 As you understand, today me and my friend Ebru analyzed the animation 'Frozen'. Our weekly topic was making a film review on Wikispace with our partner. So, we decided to choose Frozen. We chose this movie because we love both the film and songs of the film. You can read our review from this link. About Wikispace, I have to say that it is a good area to share reviews. As affordances that wiki have, you can easily shape your posts and add images, gifs etc. With the help of its practicality, it saves time when checking others' wikis and also gives you the chance to edit them and see the previous changes in post. If I have to say something negative about Wiki, I can just say that sometimes, being able to edit others' posts can create mess. Although, I highly recommend you to use it in your classroom and I will be using, too. The time we were studying, we had fun. We generally sang the songs of the movie and danced. It sometimes created problems and we wasted so much time but it is okay. 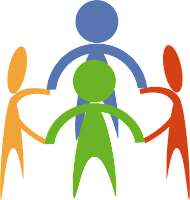 Group works are beneficial in seeing your own mistakes and learning others' thoughts in the same subject. Especially when your task is full of fun. This week, we made our first project: Podcasts! We were supposed to make our own podcasts with group. My pair was Ebru. There were 3 options in project: First was making a chant and singing it. Second was creating 60 second idea to improve the world and talking about it. The last option was creating a sound rich story and narrating it together with our partner. We chosed the last one, created a sound rich story. From the beginning, I have to say that we had a lot of fun during our project. We had to give breaks because of our laughings. My friend changed her voice so much, we had to give the feeling that the story is real. Adding all effects was sometimes became hard for us because of our lack of technology knowledge. Nonetheless, I think we did it! In my opinion, I will give the same task to my students,too. Because it helps providing correct pronunciation and gives self confidence to shy students who cannot speak in classroom. Our story is about two friends' scary day. When everything is normal, something strange happens. Here is the podcast and if you want to read the story click read more below. The time we were discussing opening the letter or not, the balloon suddenly blew up! EVERYWHERE WAS COVERED WITH BLOOD. THE SKY GOT DARKER AND DARKER, HEAVY THUNDERSTORMS AND RAIN BEGAN. We were shocked, we couldn't move, breathe and speak. We picked up the letter from ground, in fear. was written on the letter. Suddenly, the little girl screamed again! THEN A STRONG WIND STARTED. Omg! Such a bad dream. Hello everyone. Welcome to my blog. This is my first post to you. I expect we will have great time together. I am a little excited but we will learn and improve our education understanding together. I am going to share projects that I have in my school. And also inspiring quotes, techniques, images and videos that I like, about education. Hope you enjoy!